There are some really weird places on our planet, and humans always had a tendency of inhabiting them. And even if the places weren’t weird on their own, we made them so. We like to keep it strange. And rocky, obviously. Xuankong Si (The Hanging Monastery) still clings to the side of a cliff on Mt. Heng, one of the 5 most sacred mountains in China. 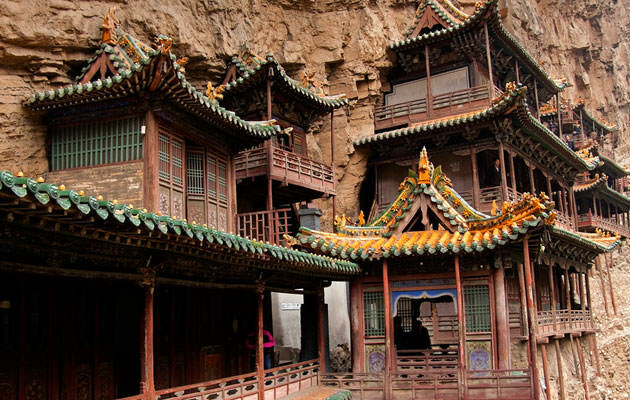 It’s located in Shanxi province and overlooks the wooded Golden Dragon River. 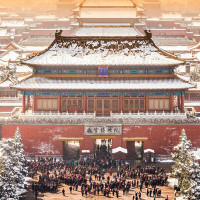 The monastery was built in 491AD using engineering techniques that are still of significant interest to modern architects around the world. Horizontal shafts were cut into the side of the mountain to serve as anchor points and then strong lengths of hard wood were driven into the holes. The monastery is thus built on a strong base; the depth of the holes and the hardness of the wood provide it. And if a crossbeam needs to be replaces, there are sufficient supports to ensure that it can be removed without impacting on the structure of the architecture gem that is the Hanging Monastery. 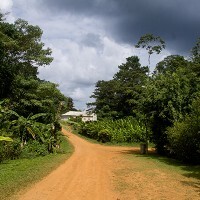 Now, it’s largely a tourist attraction although caretakers still live in its caves and halls. It’s said that it was built so high above the ground as a defense against marauders or as a protection from floods. There’s another version which says that the Monks were dedicated to silence to achieve the ideal of their practice. They couldn’t even hear the sound of a rooster crowing in the dawn, nor a dog barking. 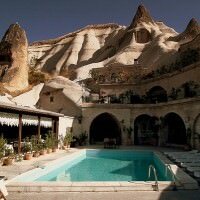 Cappadocia is a beautifully bizarre location in Anatolia, modern day Turkey. 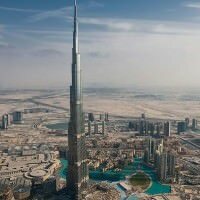 It is also one of the oldest examples of continuous human habitation in the world. Sandstone deposits have been eroded into hundreds of toadstool shapes, and then carved into by the inhabitants and turned into homes, churches, monasteries, police stations, etc. 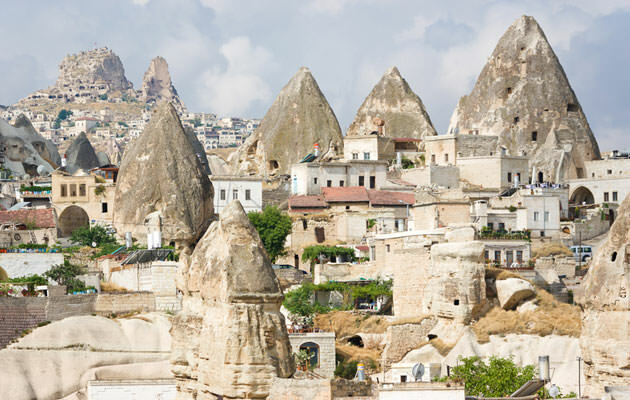 The current population of the town of Göreme, which has the best examples of the form, is 2,500 people and it’s one of the most famous historic tourist destinations in Turkey. What is so fascinating with these places is that it’s an incredible example of how humans have shaped and modified already unusual geology, while retaining its natural features. 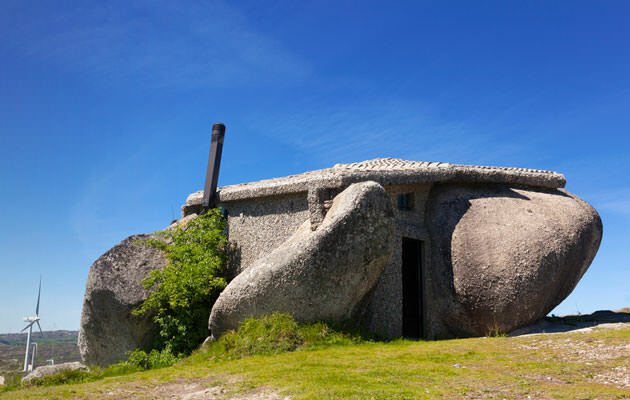 The Fafe Mountains in Northern Portugal are home to a very unusual home, which is known as Casa de Penedo – literally translated into the House of Stone. Originally built as a mountain retreat around 1974, it is now mostly known for false claims that it is a fake and that it’s was in fact created by Photoshop. Although that’s not true, people have a problem with believing that it actually exists. It has also been a frequent target of robbery and vandalism, and of course, peeping tourists who even try to enter uninvited. The House of Stone is now owned by Victor Rodriguez who no longer lives in the house, and is protected by heavy security doors and barred windows. The rustic, charming interior is larger than expected and is beautifully decorated in that style, with large wooden bench-style tables and balconies.